All educated scientists know that radioactive atoms decay and give off energy. The energy damages the mineral matrix in which the atom rests. For example, uranium decays through a series of steps or over time and the damage from the energy will form a series of concentric spheres around the inclusion. Nuclear physicist Robert Gentry researched atomic cores for more than three decades and has documented in several evolution theory problems in scientific journals, as well as in his book Creation’s Tiny Mystery (2003) that was indorse by ‘agnostic’ professor of chemistry emeritus, W. Morrow at Wofford College. Moreover, his findings were examined and confirmed by numerous scientists, Christian and atheist. In 1982, Judge William Overton handed down a decision on giving a clear, specific definition of science as a basis for ruling that creation science is RELIGION and is simply not science. The ruling was not binding on schools outside the Eastern District of Arkansas but had considerable influence on subsequent rulings on the teaching of CREATIONISM. Arkansas did not appeal the decision; nevertheless in 1987; in Edwards v. Aguillard, which dealt with a similar law passed by the State of Louisiana, teaching “creation science” was ruled unconstitutional by the Supreme Court. “…Radiometric (or radioactive) dating of rocks involves the decay of some “parent” element into its stable (nonradioactive) end product. As an example, uranium is a parent element which decays to its end product, radiogenic lead. By measuring (1) how much of a parent element in a rock has decayed into its end product, and (2) the current rate of this decay, most geologists believe they can assess the date when the parent was incorporated into the rock, or equivalently, the period of time that has elapsed since the rock formed… A uniform decay rate would mean, for example, that the amount of uranium in a rock would constantly diminish while the end product, radiogenic lead, would constantly increase. On the basis of the uniform decay rate assumption, the rock would be falsely judged to be quite ancient, not because the data (meaning the ratio of uranium to radiogenic lead) was wrong, but because of an erroneous premise. How important, then, it was to know the truth about this matter. My university physics courses had taught me to believe the assumption of uniform decay was beyond question, but no proof was given. Did such proof actually exist? If so, I needed to find it, for some weighty matters about the evolutionary scenario hung in the balance. In the late 1800s… mineralogists realized the microscope could be a powerful tool to examine many features of rocks and minerals, hidden from normal view. They especially wanted to see through pieces of rock to learn how the different minerals were interlaced. To accomplish this they learned to prepare thin, translucent slices of minerals. Mineral specimens that appeared clear of defects with the unaided eye were now often seen to contain tiny grains of other minerals …mineralogists just assumed they were embedded in the host mineral when it crystallized. Some of the tiny grains attracted attention, not because of their own appearance, but because of what appeared around them. Mineralogists saw that these grains were surrounded by a series of beautifully colored, concentric rings. Under the microscope the tiny ring patterns resembled a miniature archery target, with the grain at the center as the bull’s eye. Because of their halo-like appearance and because they exhibited color variations known as pleochroism in certain minerals, these concentric ring patterns came to be known as pleochroic halos. In 1907… Professor John Joly of Trinity College in Dublin… was also aware that uranium and its radioactive daughter products decayed in one of two ways: (1) By ejecting a very light fragment (the beta particle), which causes little damage as it passes through matter, or (2) by ejecting a much heavier nuclear fragment (the alpha particle), which interacts rather strongly as it passes through a substance. Because of its light weight the beta particle is easily bounced around and thereby takes a rather unpredictable, zigzag path before it finally comes to rest in matter. The alpha particle, on the other hand, is heavy enough to plow almost straight ahead before it stops… A single alpha particle will ionize about 100,000 atoms along its path of travel, leaving in its wake a short damage trail which remains as a permanent scar. For many years Joly studied the ring sizes of halos in rocks believed to represent some of the oldest geological ages. In 1923 Joly published a report asserting that uranium halos had ring sizes that varied with age (Joly 1923, 682). The implication was that the radioactive decay rate had varied with time. Of course this result called into question all the radioactive methods of dating rocks. In lieu of teaching in the summer of 1963 at Georgia Tech, I borrowed funds for a research trip to Dalhousie University in Halifax, Nova Scotia, where the late physicist G. H. Henderson had conducted a decade-long series of halo investigations during the 1930’s. This trip proved to be a launching point for an intensive study of radioactive halos and their startling revelation about the earth’s origin. Unfortunately, Henderson’s remaining thin sections did not contain the best uranium halos pictured in his reports. ‘…Autoradiography was the only technique that could show exactly where an alpha particle originated; hence it was the only technique which could determine whether the D halo centers were still radioactive. The autoradiographic experiments required the use of a special photographic emulsion capable of recording the passage of a single alpha particle. The first step was to split the mica specimen so that the D halo centers were either exposed on the surface or else very close to it. (The specimens chosen sometimes contained uranium halos and one or more of the A, B, or C halos as well.) Step two consisted of pouring a thin layer of this special emulsion over the exposed surface. Under these conditions, nearly half of all the alpha particles ejected from the various halo centers would pass up into the alpha-sensitive emulsion; there they would leave very short trails of ionized atoms. These short trails would remain invisible until the emulsion was developed; after development they appeared as short black tracks when viewed under the microscope. The emulsion-covered halo specimens were placed in a freezer to insure that the tiny trails didn’t fade away during the several-week or more storage time. In the early experiments the emulsion often slid over the sample during the development process. This slippage destroyed the exact registration between the emulsion and the halo centers and made it impossible to know which, if any, of the alpha tracks were actually from the halo centers. A change in procedure remedied this difficulty, and soon I had a technique for maintaining registration throughout the experiments. After the emulsion was developed, I sometimes observed a few short alpha tracks radiating from both the uranium and the D halo centers. I expected the tracks from the uranium halo centers, but the tracks from the D halos were a surprise. Something long held to be a fact was not true: the D halo centers were not extinct after all. (Later experiments have strongly suggested that the D halos are just uranium halos in an early stage of development, not really a complete surprise considering their almost identical appearance.) It had taken a lot of effort to come to this conclusion, but in the world of science it wasn’t much of a discovery. And it didn’t seem to have anything to do with my main interest in the age of the earth. ABOVE: Polonium-210 – radiohalos (“squashed”) indicate that Jurassic, Triassic, and Eocene formations in the Colorado Plateau were deposited within months of one another, not hundreds of millions of years apart as required by the conventional timescale. Polonium-218 (half-life 3 minutes) radiohalos (“orphans”) found in Earth’s granite; suggested as evidence of extremely rapid granite solidification in Earth’s base rocks or for major changes in decay rate. ‘Unspectacular though they were, I decided to present the results of these initial investigations at the January 1965 annual meeting of the American Association of Physics Teachers in New York City. My wife encouraged me to take this trip, even though it depleted the last of our financial reserves. Some new acquaintances, Drs. C.L. and A.M. Thrash, learned of this venture and soon after became the primary sponsors of my research for the next year and a half. This was a difficult time for us, and my research would surely have ended without their help. My measurements of the various halo ring sizes confirmed his tentative conclusion that the A, B, and C halos had originated with alpha radioactivity from three isotopes of the element polonium. These three isotopes—polonium-210, polonium-214 and polonium-218 (in scientific notation 210Po, 214Po and 218Po)—are all members of the uranium decay chain. This didn’t necessarily mean that the 210Po, 214Po and 218Po halos were generated by polonium atoms derived from uranium, but for reasons to be discussed shortly, Henderson postulated that this was the case. He theorized that, sometime in the past, solutions containing uranium and all its daughters must have flowed through tiny cracks, cleavages or conduits in the mica. Under these special conditions he proposed that the isotopes necessary to produce the different polonium halos would gradually accumulate at certain points along the path of the solution. Supposedly, after a certain time, a sufficient number of atoms would be collected for a polonium halo to form. ‘Earlier this explanation had seemed so plausible that I promptly accepted it and almost lost interest in the A, B, and C halos. However, since the emulsion experiments had shown that their radioactivity was extinct, I became quite interested in why they were extinct and began to think more critically about Henderson’s proposed mode of origin. Figures 2.1-2.3 show idealized three-dimensional views of the 210Po, 214Po and 218Po halos. (Color photos of these halos appear in the Radiohalo Catalogue). ‘…I began to examine polonium halos closely and paid special attention to why Henderson felt it was necessary to explain polonium halos by some sort of secondary mechanism. Of course! The reason was the vast difference in the decay rate, or average life span, between the uranium atoms and the polonium atoms. Any hypothesis proposed for the origin of the polonium halos had to take this difference into account. On the average, uranium atoms are now decaying so slowly that it would take 4.5 billion years for half of them to undergo radioactive decay. In contrast, the three isotopes responsible for the origin of the polonium halos, namely 210Po, 214Po and 218Po, decay far more rapidly. Their brief life spans present some unique problems in formulating a satisfactory hypothesis for the origin of the respective halos. ‘…According to the evolutionary Big Bang scenario, our planet began as a hot molten sphere several billion years ago. Cosmologists admit that the Big Bang, if it occurred, could have produced only hydrogen (H) and helium (He) and that the earliest stars were composed of just these two lightest elements. They assume the heavier chemical elements, of which the earth is mostly comprised, originated in thermonuclear reactions (nucleosynthesis) in the hot interiors of various stars. Supposedly these elements were ejected into space when these stars later exploded as supernovae. They further believe that the newly synthesized elements from one or more supernovae eventually reaccumulated to form vast interstellar clouds of gas. It is assumed that one of these clouds later condensed to form the primeval sun and then the embryonic planets of our solar system. Cosmologists believe a long time elapsed between nucleosynthesis and the formation of the primordial earth. And they also think a certain kind of radioactivity can reveal the approximate length of this period. In particular, they envision that some radioactive elements formed at nucleosynthesis decayed so slowly that significant fractions of the original amounts have survived to the present—uranium and thorium are examples. They also believe, however, there were other elements whose decay was slow enough for them to be initially incorporated into the primordial earth, but which have almost completely decayed away during the last several billion years. Extinct natural radioactivity is the term used for this special category of radioactive elements. Scientists have diligently sought for extinct natural radioactivity in various rocks because they think it could provide an upper limit on the time interval between nucleosynthesis and the formation of the primordial earth. Because they believe this interval was tens or hundreds of millions of years long, they have searched for certain long half-life (tens of millions of years) radioisotopes in Earth’s crustal rocks. One isotope of plutonium with a half-life of 83 million years has been found and accepted as extinct natural radioactivity because it fits in with the Big Bang scenario. The polonium halos in granites present a unique challenge to the evolutionary view of earth history because their origin can be traced directly to certain known isotopes, none of which have long half-lives. Figure 1.1 shows that 210Pb and 210Bi, whose respective half-lives are 22 years and 5 days, successively beta decay to 210Po, the alpha emitter whose half-life is 138 days. Because beta decays do not cause coloration, this means a 210Po halo radiocenter could have initially contained any one of these three isotopes, and a 210Po halo would still have resulted. Likewise, Figure 1.1 shows that a 214Po halo could have initially contained the beta emitters 214Pb, or 214Bi, whose respective half-lives are about 27 minutes and 20 minutes, or the alpha emitter 214Po, whose half-life is 164 microseconds. There is no beta progenitor for 218Po; so the 218Po halo must have originated with this isotope, whose half-life is just three minutes. Clearly, any of these isotopes which might have formed in a far distant supernova would quickly have decayed away. Never by any stretch of the imagination could they have survived the eons that supposedly elapsed before the hot primeval earth formed. Even in the hypothetical situation where polonium isotopes are imagined to initially exist on the primeval earth, they would never survive the hundreds of millions of years presumably required for its surface to cool down and finally crystallize into granite-type rocks. Thus conventional geological theory considers it impossible for polonium to be a primordial constituent of Earth’s granite rocks. This impossibility is what motivated Henderson to propose a secondary origin of polonium from uranium. Henderson classified polonium halos as extinct only in the sense that the polonium in the halo centers had already decayed away. Never did he hint that polonium halos might represent extinct natural radioactivity, and for over a year and a half neither did this possibility once enter my mind. I simply assumed Henderson’s idea for a secondary origin for them was correct—there seemed to be no alternative. Nevertheless, I was puzzled by the fact that in most cases there was no visual evidence of a concentration of uranium near the polonium halos. Even more puzzling was how the various polonium isotopes would be expected to separate to form the different halo types. Technologically, separation of isotopes is quite difficult because they have almost identical chemical properties. And something else bothered me: Henderson’s theory of polonium halo formation primarily involved uranium solutions flowing along tiny conduits or cleavages in the mica. I found, however, polonium halos were also visible in clear areas that were free from those defects. The coloration that I expected to see if uranium had flowed through those areas was generally absent. It was a curious situation. Was it possible that uranium flowed through the mica without leaving a trail of coloration to mark its passage? About this time a special acid etching technique was discovered that was capable of locating very small amounts of uranium in mica. Application of this technique to regions of mica near polonium halos showed only evidences of trace amounts of uranium (a few parts per million) that exist throughout all mica specimens—there was no concentration of uranium in or near the halo centers in the clear areas. All my attempts to confirm Henderson’s hypothesis for a secondary origin of polonium halos had failed. It seemed that polonium halos had not originated with radioactivity derived from uranium. But what other possibility was there? It was most perplexing, like having the solution to a problem but not knowing exactly what the problem was. One spring afternoon in 1965 I was examining some thin, transparent sections of mica under the microscope, a task which had been my main research occupation for over a year. Winter had begun to fade, and on that particular day I had moved the microscope to the living room. The afternoon sun beaming through the front windows provided a more conducive atmosphere for contemplation than the shadowy back room that normally served as my laboratory. Again I puzzled over the origin of some beautifully colored polonium halos. The conflicting requirements concerning their origin continued to mystify me. According to evolutionary geology, the Precambrian granites containing these special halos had crystallized gradually as hot magma slowly cooled over long ages. On the other hand, the radioactivity which produced these special radiohalos had such a fleeting existence that it would have disappeared long before the hot magma had time to cool sufficiently to form a solid rock. It was a true enigma. Would I ever resolve it? Looking up from the microscope I became aware that our home was quiet—our three boisterous young children were asleep. I wondered what they would think if they were old enough to understand what my research was all about. Was it possible that the granites had not crystallized out of a slowly cooling magma? Was it possible that the earth had not begun as a molten sphere? Was it even possible that the chemical elements of our planet were not the result of nucleosynthesis in some distant supernova at all—but instead were created instantly when the Creator spoke this planet into existence? Were the polonium halos mute evidence of extinct natural radioactivity? Was, then, the half-life of 218Po—just three brief minutes—the measure of time that elapsed from the creation of the chemical elements to the time that God formed the granites? In my search for the truth about the age of the earth, had I discovered evidence for its instantaneous creation? Were the tiny polonium halos God’s fingerprints in Earth’s primordial rocks? Could it be that the Precambrian granites were the Genesis rocks of our planet? I was stunned by these thoughts. Doubtless there were trillions of polonium halos scattered throughout the Precambrian granites around the world. If each one was evidence for creation, it was staggering to think how vast and pervasive this evidence really was! What would its effect be on radiometric and geologic calculations of the age of the earth? How might it affect the way that scientists viewed evolution? Gradually I realized the tremendous implications. Confirmed evolutionists believe that by objective scientific investigations they have been able to fit together numerous pieces of scientific data from astronomy, geology, and biology to construct the beautiful mosaic of evolution. The glue which holds this evolutionary mosaic together is the uniformitarian principle. In reality this principle is only an assumption that the cosmos, including the earth and life on it, evolved to its present state through the unvarying action of known physical laws. It is the foundation of all radiometric and geological dating methods. Without it there is no basis for assuming that radioactive decay rates have been constant and thus no basis for believing the earth is billions of years old. Nor is there any basis for geological uniformitarianism—the assumption that present rates of accumulation, decomposition and erosion have been constant throughout earth history. After all, geological processes are governed by physical laws. Since valid scientific evidence for an instantaneous creation contradicts the uniformitarian principle, it must also contradict geological uniformitarianism. Thus the adhesive for all the interlocking pieces in the evolutionary scenario dissolves, and the mosaic falls apart. Nowhere is this disintegration more apparent than in the area of time. Unambiguous evidence for creation falsifies all aspects of the theory of evolution because it invalidates the basis for the radioactive dating techniques thought to support a great age of the earth. In particular, an instantaneous creation of the granites collapses several billion years of earth history to almost nothing… The billions of years believed necessary for the earth to evolve from some nebulous mass simply evaporate when confronted by such evidence. The essential time element needed for evolution to occur just vanishes. If most of evolutionary time had vanished, there had to be another framework of earth history. Using different premises, could the Genesis account of creation and a worldwide flood provide such a framework? The basement rocks of the continents, the Precambrian granites, would be classed among the primordial Genesis rocks of our planet. And what about the vast rock formations that had been laid down by the action of water—those that contain plant, animal, and marine fossils? Evolutionary theory held that it took hundreds of millions of years for all these sedimentary rocks to accumulate and millions more for erosion to carve out scenic wonders such as the Grand Canyon. But these conclusions were hinged on geological uniformitarianism. If that assumption was incorrect, then I had to ask: Had the major sedimentary formations on the earth’s crust resulted from singular, catastrophic events rather than uniformitarian processes? If different premises were used, was it possible that the raw data from geology could also fit into a creation framework of earth history that included catastrophism? Ideas like these would not have occurred to me ten years earlier. Admittedly, my interest in pursuing this research was sparked by some philosophical questions concerning the Genesis account of earth history, but I determined to be faithful to the scientific evidence no matter where that led me. These new ideas concerning polonium halos would have to meet scientific standards. The only sure guarantee that bias was not creeping into my work would be to study this phenomenon as objectively as possible and present the results in well-known scientific journals. The scientific community attempts to guard itself against bias by publishing experimental results in its refereed literature. Such a forum would enable my data to be scrutinized carefully by researchers from many disciplines, and any errors in methodology or principle would be discerned. If polonium halos in the granites were part of the evolutionary development of the earth from the Big Bang, they must be explainable on the basis of established physical laws; their origin would have to be traceable to the effects of known chemical elements. I reasoned that, even if I failed to uncover evidence for a conventional explanation, my suggestions of a rapid crystallization of the Precambrian granites would afford other researchers an opportunity to respond with contrary evidence, if such existed. To obtain some informed feedback on my ideas as soon as possible, I decided to write up the essential details and thereby obtain private critical reviews. Dr. Robert Page, then Director of the Naval Research Laboratory in Washington, DC, agreed to have some of his staff examine the manuscript. The consensus of their opinion was that, if these ideas were published in the open scientific literature, they “should certainly create comment and some hard analysis . . . which is all to the good.” I was encouraged that the mystery of the origin of the polonium halos might yet turn into a real adventure in science. Tentatively, I identified the Precambrian granites as primordial (or Genesis) rocks because they (1) contain the polonium halos, (2) are the foundation rocks of the continents, and (3) are devoid of the fossils seen in sedimentary rocks. Such granites are coarsely crystalline rocks composed primarily of the light-colored minerals quartz and feldspar, and smaller amounts of biotite and hornblende. I would need to be careful when referring to granites because geologists often used this term to cover a variety of rocks, some of which are not at all similar to the Precambrian granite shown (below). ‘It was interesting to learn that the origin of the Precambrian granites (hereafter referred to as simply granites) had been a controversial topic in geology for many decades. One school of geologists speculated that granites, especially the massive formations known as plutons, had crystallized at great depths from slow-cooling magma. The opposite school held that the granites had resulted from recrystallization of pre-existing, deeply buried sedimentary rocks. Eventually both views had become accepted as possible explanations for different types of granites. Yet there was no experimental “standard” by which to judge the relative merits of the two views. There was no direct proof of either hypothesis because massive granitic plutons had never been observed to form. Neither had sedimentary rocks such as limestones or sandstones been observed to transform into a granite. So, in practice there was no compelling experimental evidence that proved either view was correct. I reasoned that if the polonium halos in the granites were primordial, it logically followed that the granites must also be primordial—they must be Earth’s Genesis rocks. It seemed that a crucial test of this idea hinged on determining whether the polonium halos in the granites were derived secondarily from uranium. If more exhaustive experimentation failed to reveal a secondary origin of those halos, then the primordial hypothesis would remain intact. The research I had in mind would require very expensive modern laboratory facilities. My long-term goal was to conduct in-depth research and disseminate the results through publication in the world’s leading scientific journals. Possibly this might be a difficult task because of the strong evolutionary stance of these journals. In the summer of 1965 my short-term goal was to generate the necessary interest for funding that further work. Were the polonium halos the fingerprints God left to identify the Genesis rocks of our planet? This question provided the driving, motivating force behind all my research. By late 1965 my investigations of polonium halos had yielded some results that could be submitted for publication. It seemed prudent, however, to begin with another phase of my research which concerned some puzzling, abnormally large halos. I submitted a report to Applied Physics Letters, a journal known for rapid publication of new and interesting results in physics. It successfully passed peer review (the screening process used to decide the suitability for publication), and was published early in 1966 (see Gentry 1966a in the References).
. . . It is difficult to reconcile these results with current cosmological theories which envision long time periods between nucleosynthesis and [the earth’s] crustal formation. It is suggested these [polonium] halos are more nearly in accord with a cosmological model which would envision an instantaneous fiat creation of the earth. I had been naive enough to think that something this straightforward might pass peer review. It didn’t. The editor sent the referee’s comments, quoted below in their entirety, to me. The “x x x x”s were substituted by the editor in lieu of certain remarks made by this referee. The author appears to be a perfectly competent technician who does not understand or employ the scientific method. He has observed certain phenomena (halos with anomalous radii) and has considered certain explanations and rejected them. To illustrate his logic, I quote from the next-to-last paragraph of his cover letter, ” . . . many of these variant halos cannot be accounted for on the basis of a hydrothermal mode of formation . . . and hence they do represent extinct natural radioactivity from the cosmological standpoint.” Failing to think of any other possible explanations, he concludes that the earth was formed by instantaneous fiat. In one blow he implicitly rejects all the carefully accumulated evidence of decades which is in complete conflict with his remarkable conclusion. He is undoubtedly well aware of the findings of the modern science of geochronology. The scientific approach would be to use all these results to his advantage and try to find a compatible explanation. Without going into a long harangue about “pseudoscience,” let me simply say that x x x x, and I regard the reasoning displayed in this manuscript in its present form as unworthy of publication. The experimental observations, minus any wild speculation, might be appropriately reported in a journal such as Nature. Uncomplimentary comments aside, there was one positive note. The reviewer did concede that my investigations might merit publication in the well-respected British scientific journal Nature, if the “wild speculation,” i.e., the implications for creation, were omitted from the manuscript. This experience taught me a valuable lesson: I was going to have to be more cautious about expressing the implications of the polonium halos if my results were to be published. Clearly my manuscript would have to be revised before sending it to Nature. Possibly more experimental work needed to be done. In the meantime I decided to present my results on polonium halos at the 1966 annual spring meeting of the American Geophysical Union in Washington, DC. This was a national meeting attended by thousands of earth scientists. Only a small number heard my presentation; nevertheless this occasion served to bring my results before the scientific community in a limited way. Perhaps more importantly, at that time at least, this presentation became known to the science faculty at Columbia Union College in nearby Takoma Park, Maryland. They expressed interest in my affiliating with Columbia Union College to continue my research. This new affiliation was effective in July 1966. It was a most welcome change. Acquisition of a quality research microscope and freedom to use the standard laboratory facilities available there made it considerably easier to pursue my investigations. The supportive attitude of all the science faculty, especially Dr. Don Jones, was a source of great encouragement. Additional experimental results were soon obtained. These were incorporated into a revised manuscript and sent to Nature. By leaving out any direct reference to implications for creation, this manuscript successfully passed peer review and was published in early 1967 (Gentry 1967). Using the same strategy I submitted another manuscript on halos to Earth and Planetary Science Letters, an international earth science journal published in Amsterdam; this manuscript was also accepted and subsequently appeared in this journal late in 1966 (Gentry 1966b). Although research on halos occupied most of my time, my general interest in the age of the earth had led me to preliminary investigations of carbon-14 fossil dating. In fact, as early as 1965 my attention was attracted to a report in Nature concerning the possible carbon-14 build-up in the atmosphere resulting from the 1908 Tunguska meteor explosion in Russia. My investigations of this topic were summarized in a manuscript I submitted for publication to Nature. The manuscript successfully passed peer review and was published in September of 1966 (Gentry 1966c). I realized my 1967 report in Nature on polonium halos had not settled the question of their origin in the eyes of my scientific colleagues. To more accurately test whether polonium halos were of secondary origin, I needed a method that would allow me to determine whether uranium solutions had ever passed through a specimen of mica. A newly discovered technique made this evaluation possible. It was based on the fact that an atom decaying by alpha emission leaves a very tiny damage pit when the nucleus of the atom recoils into the mica. By etching the mica with acid, these tiny pits could be enlarged sufficiently to become visible under the microscope. Thus, any uranium solution which might have supplied radioactivity for polonium halos in a piece of mica, must also have produced numerous additional recoil pits from those radioactive atoms which decayed in transit. (All mica specimens have a background density of damage pits from trace amounts of uranium.) On this basis the mica specimens containing polonium halos should have a higher damage-pit density than the adjacent areas which are devoid of polonium halos. However, a long series of experiments showed no difference in the density of damage pits between the two specimens. These experiments provided evidence against the secondary origin of polonium halos in mica. the experimental evidence indicates the inclusions of the polonium halos contained the specific alpha emitters responsible for the halos (or possibly in certain cases beta decaying lead precursors) at the time when the mica crystallized, and as such these particular halos represent extinct radioactivity. Reviewer B objected to this statement, claiming that I had proposed a “very weak and contradictory argument,” and said the manuscript should not be accepted. However, since this referee had not criticized the experimental data, I had the opportunity to ask for further consideration. After some discussion with the editorial office, it was agreed that the manuscript could be revised and that different referees and D) would be selected. My next revision avoided direct references to the contradiction which polonium halos in granites pose to the conventional view of earth history. Instead the implications were phrased in the form of a series of questions. After some delay, I learned referee C had approved this revised manuscript. My hopes were high that referee D would do likewise. Gentry proposes in this and previous papers that “extinct radioactivity” is responsible for halos whose “parents” are polonium and/or lead isotopes with half-lives ranging from 3 minutes to 21 years, and it is clear that he means “extinct natural radioactivity” by his statements that “the inclusions of the polonium halos contained the specific alpha emitters responsible for the halos (or possibly in certain cases beta decaying lead precursors) at the time when the mica crystallized,” and “it is not clear just how the existence of short half-life radioactivity may be reconciled with current cosmological theories which envision long time spans between nucleosynthesis and crustal formation.” Does he mean to imply that current cosmological (and geological) theories are possibly so wrong that all of the events leading from galactic, or even protosolar, nucleosynthesis to the formation of crystalline rock minerals could have taken place in a few minutes? Of course the answer was yes! It was gratifying to see the experimental data spoke so loudly that the implications of polonium halos as extinct natural radioactivity could not be overlooked… Despite evidence to the contrary, referee D concluded that Henderson’s model of secondary polonium halo formation must somehow be correct. The tenor of his comments made it seem futile to request further consideration of my manuscript. Yet one aspect of his response compelled me to persevere. A seldom violated rule of the peer review process is that the scientists who act as referees remain anonymous to the authors of the submitted manuscripts. But this reviewer actually requested the editorial office to make his name and address known to me. On the reviewer’s statement form he even invited me to contact him directly. Encouraged by his frankness, I telephoned him immediately. At the very outset of this first conversation he asked my opinion of the implications of polonium halos in granites. Such a direct question deserved an equally direct response. I replied that they seemed to be evidence for creation. Surprisingly enough, he didn’t hang up! Instead, this world-renowned authority in radiometric dating continued to ply me with incisive questions over the next hour. At the end of the conversation he was sufficiently impressed with the evidence to suggest that certain other experiments be conducted to enable him to further evaluate the implications of my work. These additional experiments required research equipment not available at Columbia Union College. A search for the necessary facilities led me to inquire at the Oak Ridge National Laboratory in Oak Ridge, Tennessee. Years before, while I was still in Atlanta, a staff scientist, Roger V. Neidigh, had kindly assisted in getting some experiments done at this outstanding research complex. I was again extremely fortunate that another Laboratory scientist, John W. Boyle, took a personal interest in arranging for the additional experiments then needed. Without his cordial and very able cooperation they could not have been done. With the results of these new experiments and a newly revised manuscript in hand, I visited referee D at his own laboratory. This fair-minded colleague made an exhaustive study of the new results and concluded that polonium halos in granites were more perplexing than he had first thought to be the case. The lack of evidence to support the hypothesis that they originated from some secondary source of uranium puzzled him. He indicated a willingness to consider this revised manuscript for publication provided there was no mention of the possibility that polonium halos may have originated with primordial polonium. This report, “Fossil Alpha-Recoil Analysis of Variant Radioactive Halos,” was subsequently published in the June 14, 1968, issue of Science (Gentry 1968; Appendix—this notation indicates the report cited is also reprinted in the Appendix). In addition to my research on polonium halos, I had continued to study some unusual halo types known as the dwarf and giant halos. Their rarity and uncommon sizes suggested they might have originated with an unknown type of radioactivity. In late 1968 the U.S. Atomic Energy Commission (AEC) first became aware of my research on dwarf and giant halos through a contact I initiated with the scientist who was then Chairman of the AEC. Subsequently, arrangements were made for me to give a seminar on my research at the Lawrence Radiation Laboratory (now the Lawrence Berkeley Laboratory) and the Oak Ridge National Laboratory (ORNL). Both laboratories were among several around the world which were then initiating a search for superheavy elements—chemical elements with atomic weights heavier than any previously discovered in nature. Because the dwarf and giant halos seemed to be evidence of unknown radioactivity, I was invited to affiliate with ORNL as a guest scientist and join them in their search for superheavy elements. This one-year opportunity, which stretched to thirteen years, greatly accelerated my research. Before joining the Oak Ridge National Laboratory the AEC wrote letters of introduction enabling me to visit two well-known Soviet scientists who were involved in the search for superheavy elements. My trip to the Soviet Union in the spring of 1969 included stops in Moscow and Dubna, where the Soviet nuclear laboratory equivalent of ORNL is located. My move to ORNL occurred in July 1969. By 1970 I had completed a series of new experiments on giant halos using the advanced scientific instrumentation available there. A manuscript detailing those results was prepared for publication. After it passed the standard internal review process at ORNL, it was submitted to Science. With minor revisions this report was published in August 1970 as “Giant Radioactive Halos: Indicators of Unknown Alpha-Radioactivity?” (Gentry 1970; Appendix). Eight possible explanations for the origin of the giant halos were examined, but at that time none, including superheavy elements, could be identified as the final solution. The origin of the giant halos remained an enigma, and this attracted attention to my research. Soon after joining ORNL as a guest scientist, I submitted a proposal to the National Aeronautics and Space Administration (NASA) to search for halos in rocks returned from the Apollo 11 mission to the moon. This proposal was accepted by NASA, and a search was made of the thin sections of the lunar rocks then available. No halos were found. This is not surprising when one considers that the minerals which most often contain halos (in earth rocks) are generally absent from the lunar rocks returned on the Apollo missions. In addition, most of those lunar rocks had recrystallized from molten material produced by meteorite impact. Any halos, if they had existed, would have been destroyed in this process. My summary report on these investigations was published in the Proceedings of the Second Lunar Science Conference (Gentry 1971a). The same advanced analytical techniques employed to study the giant halos were also adaptable to the study of polonium halos. Most of my earlier research on polonium halos had involved the optical microscope, in combination with chemical etching and neutron irradiation techniques. 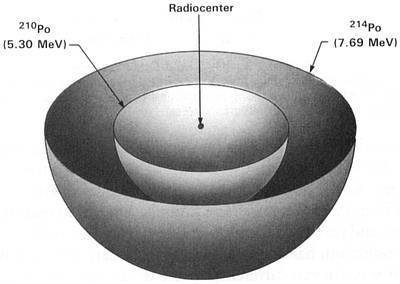 These procedures were quite useful in showing that uranium was generally absent around the polonium halos, but they could not reveal the composition of the halo centers. With the equipment available at ORNL, I analyzed the centers of the halos, the tiny specks where the radioactive atoms themselves were originally encased. Using advanced mass spectrometry techniques I discovered that polonium halo radiocenters contained a composition of the chemical element lead which was different from any previously known. This new type of lead, greatly enriched in the isotope 206Pb, could not be accounted for by uranium decay; yet it was exactly that expected on the basis of the decay of polonium in the halo center. These experimental results, along with others obtained on the puzzling dwarf halos, formed the basis of another report published in Science in 1971 (Gentry 1971b). Now the reason for the various attempts to account for Po halos by some sort of secondary process is quite simple; the half-lives of the respective Po isotopes are far too short to be reconciled with slow magmatic cooling rates for Po-bearing rocks such as granites (t½ = 3 min for 218Po). (Gentry 1973, 356). Suggesting a rapid synthesis of the earth’s basement rocks was like raising a red flag before some of my colleagues. Such statements invited scientists to refute my results if it could be done. We now report the results of a series of measurements made on polonium-type halos. Our measurements do not support the polonium halo hypothesis. We cannot definitely rule out the existence of polonium halos, but it appears that there is no evidence requiring, or even firmly suggesting, their existence. It was realized very early that their existence would cause apparently insuperable geological problems since the relevant polonium half-life is of the order of minutes. Polonium halos would require that the polonium atoms become part of the inclusion within minutes of the formation of the polonium and that in this very short time the polonium must be so far removed from the parent uranium mass that its presence or location is no longer evident. (Moazed et al. 1973, 1272—italics mine). The issues had begun to focus. These scientists saw that polonium halos in granites presented “apparently insuperable geological problems” to the conventional view of earth history. To protect this view they suggested that polonium halos might not even exist, claiming instead they might just be uranium halos. In preparing my reply to the Moazed et al. report I spent months studying uranium and polonium halos, both in mica and in another mineral, fluorite. The Radiohalo Catalogue (see Contents) shows photographs of a variety of those halos. Fluorite sometimes occurs along with mica in the so-called granitic pegmatites—regions within granites where crystals of different minerals can be quite large (several feet long in certain instances). The polonium halos in fluorite are virtually identical to their counterparts in mica. Sometimes they occur along tiny cracks and fissures and sometimes in regions free from mineral defects. Polonium halos in fluorite in defect-free regions are significant because this mineral does not exhibit the perfect cleavage property of mica. Since no cleavages exist for uranium solutions to have flowed in a laminar fashion through fluorite crystals, this excludes the possibility that polonium halos in defect regions could have originated secondarily from uranium daughter radioactivity. This is the same conclusion reached earlier in this chapter when the origin of polonium halos in mica were investigated using alpha-recoil techniques. A number of new experimental techniques were incorporated into my response to the 1973 report of Moazed et al. A variety of experimental results, obtained with particle accelerators and a scanning electron microscope equipped with x-ray fluorescence capabilities, formed the basis for unambiguously identifying three different types of polonium halos in granites. I elaborated on a new standard for halo-size measurements to show conclusively that polonium halos are easily distinguished from uranium halos by their ring structure. Electron-induced, x-ray fluorescence analysis of selected uranium and polonium halo centers confirmed this difference: the uranium halo centers showed considerable amounts of uranium and only a small amount of lead, whereas the Po halo centers showed only the lead.
. . . It is also apparent that Po halos do pose contradictions to currently held views of Earth history. I stated these implications plainly, thus inviting my scientific colleagues to challenge the evidence; however, no one responded to this report. During a routine examination of a mica specimen from the Silver Crater Mine near Faraday Township in Ontario, Canada, I discovered a most unusual pattern of 210Po halos. In the more than 100,000 halos which I had examined under the microscope, none had even faintly resembled the connecting circular patterns observed in this “spectacle halo” (a photograph of which is shown in Figure 3.1 and in the Radiohalo Catalogue). Incidentally, the shape of this special halo is completely different from any of the known crystallization patterns, all of which yield minerals with straight edges. No mineral crystallizes in circles; yet for some reason the radiocenters of the “spectacle halo” did. From its appearance it was the crown jewel of halos. If single or small groups of polonium halos had defied explanation by conventional scientific principles, it was certain that the intricate array of polonium halos in the “spectacle halo” could only further compound the problems of explanation. Because of its special value, a variety of analytical techniques were used in some exhaustive studies of this special halo pattern. The experimental results on this unique halo, obtained in collaboration with several of my colleagues, were first submitted for publication to Geophysical Research Letters in the spring of 1974. In this manuscript I made some explicit remarks about the constraints which polonium halos place on cosmological theories. One reviewer recommended that the manuscript be rejected, while the other recommended that it should be published. The latter made the rather astonishing comment that the experimental results were “. . . indeed impossible to understand in terms of known nuclear physics and geochemistry.” In spite of this remark the editor rejected both this manuscript and the revised version. The last chapter emphasized that when I associate polonium halos in granites with extinct natural radioactivity, scientists understand this to imply only a few minutes elapsed from nucleosynthesis to the formation of a solid earth. As Figure 2.4 (b) illustrates, the only “nucleosynthesis” that could accomplish this feat is the “nucleogenesis” initiated by the Creator—that of a virtually instantaneous creation of the earth. This report did not go unnoticed. In a letter to Nature, Professor J. H. Fremlin, a leading radiophysicist in England, resurrected the idea that polonium halos in granites were secondarily derived from uranium, but provided no new data to support his suggestion (Fremlin 1975). Moreover, he tended to overlook much of my published evidence showing polonium halos [p. 50] in granites had originated independently of uranium. Years earlier it occurred to me that this type of thing might continue indefinitely unless I could find polonium halos which were definitely of secondary origin and show how they differed from polonium halos in granites. My search was successful, and the results were so relevant to the question of polonium halo origin in granites that I briefly mentioned them in my response (Gentry 1975) to Fremlin’s letter. Unfortunately, some colleagues overlooked these new data the next year when they too proposed a secondary origin of polonium halos in granites (Meier and Hecker 1976). Their oversight was more understandable than the case of others (Hashemi-Nezhad et al. 1979) who later overlooked my complete report on the new data published in 1976 (Gentry et al. 1976a; Appendix). As the next chapter shows, that 1976 report describes where secondary polonium halos were discovered and how they were found to be intrinsically different from the polonium halos in granites. The evidence in this report directly contradicted the idea of a secondary origin for polonium halos in granites. But we shall see later that some scientists would still find it difficult to accept this conclusion. These special requirements brought to mind a reference to radioactivity in wood about which I learned several years earlier (Jedwab 1966). Further checking revealed that pieces of wood, partially turned to coal, some as large as logs, had been found in certain uranium mines in western states. The mines were located in the uranium-rich sedimentary deposits in the region geologically known as the Colorado Plateau. Previous microscopic studies of thin slices of these specimens showed halos, having formed around uranium-rich sites. The evidence suggested the wood had been in a watersoaked, gel-like condition at some earlier period in earth history. At that time solutions rich in uranium had passed through the wood, thus permitting the accumulation of uranium at certain sites with an affinity for that element. Secondary halos had then formed around those uranium centers. These earlier studies were intriguing. If these coalified wood specimens contained microscopic sites which had captured uranium, possibly other sites might have captured polonium. Coalified wood specimens had been found in a number of uranium mines, but they were an uncommon occurrence. Moreover, some of those mines were now closed. Ordinarily it would have been a long and arduous task to collect such specimens. Fortunately, though, I obtained a variety of coalified wood pieces from a colleague who had earlier collected samples from the mines for his own investigations (Breger 1974). It occurred to me that, irrespective of whether or not these specimens contained secondary polonium halos, they might contain important clues relative to the age of the earth and occurrence of a worldwide flood. To understand my thoughts at that time requires a brief description of some different types of rocks and their histories. Scientists generally agree that sedimentary rocks are initially the result of transport and deposition by ice, wind, or water. Many sedimentary (or secondary) rocks, such as shale, sandstone, and limestone, often contain the fossil remains of plants and animals from both terrestrial and marine environments. The Precambrian granites, which are one type of crystalline rocks, do not contain fossils. While there is general agreement on what sedimentary rocks are, views differ regarding how rapidly and under what conditions they actually formed. The evolutionary view, based on geological uniformitarianism, is that they ordinarily formed slowly over hundreds of thousands or millions of years by geological processes operating at the same rates as observed at present. Interestingly, some geologists now admit that some individual layers could have formed rapidly under “storm” conditions (Ager 1981). One immediate problem with the uniformitarian viewpoint is the difficulty in finding a location where sedimentary rock formations are in the process of developing at present. River and ocean sediments are forming today, but it is questionable whether any of these will ever turn into the massive limestone and sandstone formations seen in various parts of the world. Nevertheless, evolutionary geologists usually assume that the different sedimentary formations accumulated from the build-up of marine deposits left from the ebb and flow of inland seas over millions of years. The alternate view of how most sedimentary rocks formed is based on the occurrence of supernaturally induced, catastrophic events associated with a worldwide flood. The scriptural record indicates that the entire earth was covered with water for over a hundred days. Sedimentary material could have been deposited both during the time when the waters were rising and again when they were receding. The scriptural statement, “fountains of the great deep were broken up,” suggests that parts of the earth’s crust were broken open, implying that the flood was a period characterized by intense volcanic activity. Volcanic eruptions in the ocean basins would have triggered tidal action, resulting in the burial of animal, marine, and plant remains into freshly deposited sediments. The existence of well-preserved fossils in sedimentary rocks is often cited as evidence of a very rapid burial, in agreement with the above scenario. A rapid deposition of different sediments would also be expected to produce only occasional erosion between successive layers. A prime example of uniform layering of successive formations can be seen in the Grand Canyon. If the horizontal sedimentary layers seen there were really separated by vast periods of time, one would expect to find deep irregular cuts and other signs of erosion within the different layers. Instead, such features are the exception rather than the rule. Many geologists pay little attention to these arguments for the flood scenario, perhaps because they believe radiometric dating confirms their views of an ancient age of the sedimentary formations. In particular, radiometric dates of 55 million to 80 million years have been assigned (Stieff et al. 1953) to some of the Colorado Plateau formations where the coalified wood specimens are found. On the basis of the flood model these formations were deposited within a few months of each other only a few thousand years ago. Which was correct? Did radiometric dating justify an ancient age of the coalified wood, or had misplaced confidence in the uniformitarian principle, and hence a constant decay rate, led my colleagues to misinterpret the data? Perhaps too, some of the data had escaped their attention. A singular thought occurred to me. The coalified wood specimens I was soon to receive might have been parts of trees that were growing immediately prior to the flood. My anticipation began to build. When the secrets of the granites were unlocked, they appeared as rocks that were created—the Genesis rocks. Likewise, did these coalified wood specimens contain secrets that would link them to another part of the Genesis record—the account of a recent worldwide flood? My observations of the coalified wood specimens from the Colorado Plateau agreed with the major conclusions of other investigators. Evidence indicated that sometime in the past, prior to coalification, a uranium solution had infiltrated the wood when it was in a water-soaked, gel-like condition. As earlier noted, other investigators had reported the halos around uranium-rich centers. These I saw as well, often in abundance. This encouraged me to continue the search for secondary polonium halos in these specimens. In this case persistence paid off—the long awaited day arrived. In a number of the coalified wood thin sections I discovered secondary polonium halos in greater numbers than the secondary uranium halos. Amazingly enough, sometimes there were over a hundred of them in just one square inch of a coalified wood thin section! Curiously, I found that the polonium halos in these specimens were of only one type—those that had formed from the accumulation of 210Po. None of the other two polonium halo types that occur in granites were seen. The reason for the absence of the 214Po and 218Po halos became clear after I reflected on the difference in the half-lives of the three isotopes. In brief, the 210Po atoms lived long enough (half-life of 138 days) for them to be captured from the infiltrating uranium solution before they decayed away. In contrast, the other two polonium isotopes, with half-lives of minutes or less, decayed away before they could accumulate at the tiny polonium capture sites. Nature had provided the most favorable conditions for producing secondary polonium halos, namely, an abundant uranium supply coupled with high mobility. Yet even under these optimum conditions only one type of polonium halo had formed. These experimental data presented an insurmountable obstacle to the idea of a secondary origin of polonium halos in granites. That is, if only one polonium halo type could form secondarily under the best natural conditions, what was the scientific basis for theorizing that all three types could form secondarily in the granites? In these rocks both the high uranium content and rapid transport capability were missing. And this was not all. Most of the secondary 210Po halos in coalified wood exhibited elliptical rather than the circular cross-sections typical of halos in minerals. How were these unusual halos produced? The simplest reconstruction of events pictures uranium solutions infiltrating water-soaked wood that was freshly emplaced in the Colorado Plateau deposits. Halo radiocenters, composed of lead and selenium, accumulated atoms of 210Po out of that solution. In less than a year, secondary 210Po halos developed from the alpha decay of those atoms. Naturally, these halos first formed as spheres and hence initially had a circular outline, just as the halos in minerals. However, as pressure from overlying sediments increased, the gel-like wood was easily compressed, thus leading to the development of the elliptical halos as shown in Figure 4.1(a) and the Radiohalo Catalogue. Their occurrence in three geological formations suggests they all originated at about the same time in agreement with the flood-related scenario. It could be argued, however, that secondary polonium halos might have formed in three widely spaced but almost identical geological scenarios instead of the one scenario related to the flood. To be fair, we must carefully examine this possibility. Here we must realize that the formation of secondary polonium halos required an extraordinarily complex, interrelated series of geological events. The basic ingredients were: (1) water, (2) uprooted trees as the source of the logs and smaller wood fragments, (3) a rich uranium concentration near the wood, and (4) a compression event occurring after the uranium solution invaded the wood, but prior to its becoming coalified. The gel-like condition of the wood suggests only a short time had elapsed since the trees had been uprooted. At the very time the wood was in this special condition, it had to be infiltrated by a solution that had recently dissolved uranium from a nearby deposit. Note that, if the water had contacted the uranium deposit after infiltrating the wood, there would have been no radioactivity in solution and hence no possibility of forming secondary halos. The same is true if the wood had already turned to coal before contact with the uranium solutions. The evolutionary scenario requires that the complex sequence of events described above must have been repeated more than ten million years later in the same geographical location. That this scenario would occur a third time, again in the same area about fifty million years later, seems improbable. Yet the issue must not be decided merely on the basis of improbability. Instead, we must determine whether this interpretation is in harmony with all the scientific data. Previously, geologists drew conclusions about the history of the Colorado Plateau formations based on data then available to them. We must now focus special attention on the new data presented by the halos in coalified wood to see if these earlier conclusions are still justified. It is quite significant that the elliptical polonium halos appear in coalified wood specimens from three different geological formations in the Colorado Plateau deposits. The importance of this observation can hardly be overestimated. In the evolutionary scenario those formations represent three geological periods: Triassic, 180 to 230 million years ago; Jurassic, 135 to 180 million years ago; and Eocene, 35 to 60 million years ago. The occurrence of the elliptical secondary 210Po halos in specimens from all of these formations is evidence par excellence that the wood in all of them was in the same gel-like condition when infiltrated by a uranium solution. These data fit the flood model perfectly. Another vital piece of scientific data relates to the question of how much time elapsed from the formation of the circular polonium halos to the time of compression. The length of this period would have remained uncertain had it not been for the discovery of “dual” polonium halos such as shown in Figure 4.1 (b) and the Radiohalo Catalogue. These “dual” 210Po halos, which I have seen thus far in Triassic and Jurassic specimens, exhibit both a circular and elliptical outline. (The search for dual halos in “Eocene” wood has been hindered by lack of material.) Initially, I was puzzled as to how two differently shaped halos could develop around the same center. Then I realized that the halo centers, composed of lead and selenium, could also have captured another uranium daughter, 210Pb. Since this isotope of lead decays with a half-life of about 22 years to 210Po, a second 210Po halo could develop within about 20 years after the first one had formed. If there was no deformation of the wood, then both halos would remain circular and they would exactly overlap. Or if the wood was deformed after about 20 years, then both halos would be compressed into an elliptical shape and they still would overlap. However, if deformation of the wood occurred within just a few years after the introduction of the uranium, then only one 210Po halo could have been compressed because only one (from 210Po) had then formed. Several years later another circular halo could develop (as 210Pb decayed to 210Po) and superimpose on the elliptical halo. Provided there was no further deformation, these two halos would retain their respective shapes and now appear as the “dual” halo shown in Figure 4.1(b). From this sequence a very relevant conclusion emerges: only a few years elapsed from the introduction of the uranium to the time when the wood was compressed. These data very specifically support the flood model, which includes considerable readjustment and deformation of freshly deposited sedimentary rocks in the years after the flood waters receded. Additional data on the coalified wood specimens were obtained in collaboration with some colleagues. We studied radiohalos in coalified wood using the same type of advanced scientific instruments that had been used on halos in granites. A report describing the outcome of these collaborative studies was published in the October 15, 1976, issue of Science (Gentry et al. 1976a; Appendix). The evidence obtained in these experiments suggested a common source for the uranium in all the coalified wood specimens. These data implied only one uranium solution had infiltrated the different wood specimens. This result, coupled with the observations just described, permits some rather firm conclusions to be drawn. In particular, a single uranium solution means the uranium infiltration occurred nearly simultaneously in all the wood specimens. And since the elliptical polonium halos show the wood specimens taken from the Jurassic, Triassic, and Eocene formations were all in the same gel-like condition at the time of infiltration, it inevitably follows that these geological formations were all deposited at about the same time. Likewise, the presence of dual polonium halos in wood specimens taken from both Jurassic and Triassic deposits provides strong evidence that the event which compressed the wood occurred simultaneously in both cases. This is exactly what would be expected on the basis of a near simultaneous deposition of all the wood at the time of the flood. On the other hand, the data just discussed directly contradict the view that the Jurassic, Triassic, and Eocene formations in the Colorado Plateau were laid down tens of millions of years apart. If the evolutionary scenario were correct, the wood in the Triassic (oldest) formation would have turned into coalified wood millions of years before the Eocene layer was deposited. In this case compressed halos could not have formed. The above evidences contradict the evolutionary view that a hundred million years or more separate certain formations in the Colorado Plateau, supporting instead a rapid deposition of them all. The coalified wood in these sediments ranges in size from finely divided intergranular fragments visible with a hand lens to entire tree trunks many feet long and still having attached branches and roots. The larger pieces of coalified wood are compressed or uncompressed, black or brown in color, and may or may not contain siliceous, calcitic, or dolomitic fillings replacing the original pithy cores. Some coalified fragments are still flexible when first collected but become brittle when dried. Black and brown fragments are occasionally superimposed upon each other; the former have the appearance of lignite, whereas the latter outwardly resemble vitrain. . . . (Breger 1974, 100—italics mine) I suggest the flexibility of some freshly collected wood fragments is strong evidence of a rapid deposition. (1) Uranium to lead ratios were found suggesting that the various Colorado Plateau formations are only several thousand years old instead of the 60 to 200-million-year age required by the evolutionary time scale. Timewise this evidence agrees with the scriptural chronology concerning the time (ca 2300 b.c.) when the worldwide flood occurred. Thus, the entire radiometric age-dating scheme developed over the past eighty years is called into question. (2) The coalification process—whereby organic material such as plant vegetation or wood turns into coal—can occur in a year or less. This result contradicts the presumed tens of thousands of years (or more) thought necessary for the coalification process. Interestingly, I have found references to experimental data suggesting that, under certain laboratory conditions, the process of coalification can occur over just a few days (Stutzer 1940, 105-106; Larsen 1985). Such data are consistent with my results. I have been patiently scanning the “letters” section of Science since the publication by you and your colleagues of your findings on radiohalos. The silence is deafening—I think it can be interpreted as “stunned silence,” coming as closely as it did on the “neutrino crisis” stemming from a paper published in January 1976 on the absence of the expected neutrino flux from the sun. Your results will not greatly trouble the engineer, whether he is a mining engineer, a geophysical engineer, or a ground-water engineer. But the impact on the science of geology, in possibly changing the accepted views as to the duration of geologic time, will be felt for many years. We are indebted to you and your colleagues for your painstaking observation, the careful wording of your paper, and the courage you have manifested in presenting evidence that contravenes the conventional wisdom of the geological profession. I might add that the findings have direct application in the search for a semi- permanent containment for radwastes. Again, my commendations for a difficult job, extremely well done. Thank you for the reprints. It is apparent that you and your coworkers are unearthing fundamental information which will be difficult, if not impossible, to include in the accepted, uniformitarian-evolutionary, scheme. Here at LSU we are considering organizing a one or two day conference on geologic time including the age of the sun. There will probably be a number of invited papers and I will suggest to the conference organizer that you be invited, once the decision has been made. If you have any thoughts on possible speakers, please let me know. Professor Kazmann correctly perceived that the data have called the evolutionary scheme into question. He also understood that if conventional dating techniques have been in error, as the data suggested, this might raise [p. 61] questions about the procedures currently used to select nuclear waste storage sites. To explore these matters further, he organized a symposium addressing the problems and methods used in measuring geologic time. The polonium halos, especially those produced by 218Po, are the center of a mystery. The half-life of the isotope is only 3 min. Yet the halos have been found in granitic rocks . . . in all parts of the world, including Scandinavia, India, Canada, and the United States. The difficulty arises from the observation that there is no identifiable precursor to the polonium; it appears to be primordial polonium. If so, how did the surrounding rocks crystallize rapidly enough so that there were crystals available ready to be imprinted with radiohalos by alpha particles from 218Po? This would imply almost instantaneous cooling and crystallization of these granitic minerals, and we know of no mechanisms that will remove heat so rapidly; the rocks are supposed to have cooled over millennia, if not tens of millennia. His studies of halos in coalified wood [Gentry et al. 1976a; 315] bear directly on the meeting’s topic: geochronology. There he and his co-workers were able to define the tiny uranium centers and to distinguish the various halos produced by different alpha emitters. The publication of this clearly stated evaluation of my results was an important event in my research. Kazmann’s account of the LSU symposium in both Geotimes and EOS, two nationally circulated geological news magazines, brought my work to the attention of a much larger segment of the geological community. It was difficult to believe that my contribution to the LSU symposium would go unchallenged. I would appreciate your comments on whether the remarks of Paul Damon in his letter of January 23, a copy of which was sent to you, are scientifically sound. If they are, it will be my inclination to publish them as soon as possible in EOS.Please let me know your opinion by return mail if possible. I will also consider further commentary on this article as it becomes available. As you well know and expressed in your letter, the conclusions you reached from the interpretation of your halo data are considered untenable except by a very tiny minority of the earth sciences community. Nevertheless, my reviewers feel that you are due an opportunity to respond to Damon’s comments, but you must make that response short. Damon agrees that my observations on polonium halos are “apparently valid,” but he rejects the possibility that they are of primordial origin without offering an alternative explanation. It was becoming increasingly apparent that an experimental test was needed to settle the question of their origin. Damon’s strongest objections to my results centered around two points—the association of polonium halos in granites with primordial polonium and the identification of the Precambrian granites as the primordial Genesis rocks of our planet. It occurred to me there was a laboratory experiment which, if successful, in theory would allow scientists to confirm a major prediction of the evolutionary scenario and at the same time falsify my model of creation. To understand this test readers must remember that in the evolutionary model the proto-earth began some 4.5 billion years ago in a semi-molten condition. A slowly cooling earth supposedly led to the formation of various types of rocks at many different times and places. Geologists think that the Precambrian granites, the crystalline basement rocks of the continents, were among those rocks that formed at different intervals over that long cooling period. According to the uniformitarian principle the physical processes which governed the crystallization of the granites in the past are the same as those operable on earth today. The inevitable conclusion is that it should be possible to duplicate the process of granite formation in a modern scientific laboratory. That is, it should be possible—provided the uniformitarian principle is really valid.
. . . Therefore I regard the failure to resolve the long-standing controversy in geology which concerns the origin of the Precambrian granites to be because such rocks are primordial and hence not necessarily explainable on the basis of conventional principles. Even though I think they further qualify for that role in their association as basement rocks of the continents, nevertheless I would consider my thesis essentially falsified if and when geologists synthesize a hand-sized specimen of a typical biotite-bearing granite and/or a similar size crystal of biotite. Much was and still is at stake in issuing this challenge to synthesize, or produce a duplicate of, a single hand- sized specimen of a piece of granite [p. 66] in the laboratory. The experiment being proposed is quite straightforward. The basic chemical elements of a granite, which are well-known, are to be melted, and then allowed to cool to form a synthetic rock. If my colleagues could do this experiment so that the synthetic rock reproduces the mineral composition and crystal structure of a granite, then they will have duplicated or synthesized a piece of granite. By doing this they would have confirmed a major prediction of the evolutionary scenario—they would have demonstrated that granites can form from a liquid melt in accord with known physical laws. I would accept such results as falsifying my view that the Precambrian granites are the primordial Genesis rocks of our planet. Furthermore, if they were successful in producing just a single 218Po halo in that piece of synthesized granite, I would accept that as falsifying my view that the polonium halos in granites are God’s fingerprints. This test of the creation and evolution models was published in the open scientific literature for all my colleagues to study. In the spirit of free scientific inquiry I hoped they would closely examine my published evidences for creation and be led to respond with contrary evidence, if I was wrong, or else admit there was valid scientific evidence for creation. Neither of these happened. I have spent a great deal of time working on the response to Derek York’s direct attack on my research. I could have helped York avoid some embarrassing remarks if he had only shared his article with me prior to publication. . . . But whatever the reason for York’s secrecy, I cannot let his misrepresentations of my work go unanswered. Actually, there is much more I could have said—and may yet have to say—about his comments on my work. The length of this manuscript is about half that of York’s article, and, in fact, about the same length as my response to Paul Damon’s letter. Be assured that I have high personal regard for Derek York, even though I have had to take exception to his remarks. I have forwarded your article to one of the EOS Associate Editors for review with regard to quality of the substance and for consideration of its suitability for publication in EOS. These will be difficult questions. Our decision will rest on whether your present letter makes any substantive addition to the discussion and on the completeness and validity of the work on which it is based. New material may also be rejected by EOS as it is not an appropriate medium for original publication of scientific results. I enclose a cut down version of the letter you submitted in response to York’s paper on polonium halos. I would be willing to publish this in EOS immediately. I believe that publication of this letter would call attention to the principal exceptions you take to his remarks. In the interests of conducting the scientific process in an orderly way, more extended technical discussion should be directed to journals devoted to the publication of original research and/or reviews. As per your suggestion, I would very much hope that Derek York and others will eventually publish some original research material on radiohalos in specialty journals. And for your sake I am willing to make some significant concessions on the length of my reply and not demand that my original version be published. But I would also hope that you could see why my few brief technical comments need to be incorporated into the revised version. First, to give Derek the privilege of making technical criticisms of my research while denying me the privilege of specifically responding to those comments constitutes discrimination against a minority view. It would be a case of the establishment attempting to suppress unpopular evidence. You have not struck me as the sort of individual who would agree to this sort of thing. Second, for me not to specifically respond to Derek’s technical comments would leave the impression that I don’t have a response, or else it would have been published. After all, a rebuttal is meaningless if it simply says I am right and the other guy is wrong. Third, it would seem that if this question is ever going to be resolved, those few technical comments need to be put in so that when the next fellow comes along and takes a shot at me, he will at least be firing at the right target. Let me explain. It is conceivable, I think, that Derek read my reports but simply did not catch the significance of the difference in the Po halos in granites and coalified wood. This difference is absolutely crucial to any proposed explanation of Po halos in granites and needs to be briefly spelled out so that other researchers won’t go down blind alleys thinking they have solved the problem. Here I want to emphasize that my brief technical response to Derek is not a matter of publishing new data; it is simply that of clarifying data which has already been published but which has been misinterpreted. So, Fred, I am returning to you a revised version of my reply, which is basically the version you sent to me with the technical comments added. The last sentence or so has been modified to make up for the loss of the background material that has been left out. And one very important citation has been restored to the references along with one or two word changes here and there. In closing let me again remind you that I did not instigate this discussion and I am not trying to turn it into a cause célèbre. I am of the opinion, however, that there are some individuals who may want to do this if they knew about my difficulties in getting this reply published. In this respect, as volatile as this subject is, there is also a possibility it could turn into a mini-Watergate if some within the news media suspected there was an attempt to suppress or cover up my rebuttal evidence. For your sake I am sincerely hoping this does not happen. As before, I am requesting that you have the galley proofs sent to me before publication. I have come a long way, and I don’t even want a misspelled word to come out under my name, much less an inadvertently omitted word that could change the meaning of a sentence. I know you have been under great pressure about this situation, and I am trying not to make it any harder on you. Your efforts to be fair are greatly appreciated. Certainly I still greatly appreciate his efforts. Much was at stake in my work. It was imperative that I be given the right to respond because York had completely ignored the two main features of my letter in the May 29, 1979, issue of EOS (Gentry 1979), namely, the challenge to synthesize a piece of granite and the reference to Professor Norman Feather’s conclusions relative to the origin of polonium halos in micas. Feather’s doubts about polonium halos in granitic micas having originated from uranium daughter radioactivity, or from isomers, in essence confirm my earlier investigations. His conclusions were derived from a theoretical investigation of the nuclear properties of the relevant isotopes. My 1968 and 1976 Science reports (Gentry 1968; Gentry et al. 1976a; Appendix) and the 1973 Nature report (Gentry et al. 1973), to which Feather refers, show respectively that the secondary radioactivity and isomer hypotheses are not valid for polonium halos in granites. Feather did not propose a primordial origin of the Po halos as I have done, yet the results of his investigation greatly strengthened my contention that a conventional explanation of the Po halos in granites is scientifically untenable. York seems to regard even the existence of Po halos as only tentative. But notwithstanding the uncertainties, his article leans heavily toward the proposition that Po halos do exist, at least in micas. York’s thesis is that Po halos are most probably explainable within the accepted framework because the interlocking nature of various radiometric dating techniques provides powerful evidence that conventional geochronology is correct. York faults me for ignoring this internal consistency. Contrary to his understanding, I do not ignore these data. But neither do I accept the idea that the presumed agreement between techniques is really coercive evidence for the correctness of the uniformitarian assumption which undergirds the present model. There was no discussion of the 238U/206Pb ratios [Gentry et al., 1976a], which raise significant questions about the accepted geochronological scheme. While I can appreciate York’s desire to emphasize internal consistency, it should be evident that irrespective of how much data has been or yet can be fitted into the present model, the question of its ultimate reliability hinges on whether there exist any observations which falsify the theory. . . .
York’s surprise that I would accept Henderson’s hypothesis for Po halos in coalified wood [Gentry et al., 1976a] but reject this explanation for mica because of the slowness of solid state diffusion suggests first that the same type of Po halos has been found in both substances and second that my only objection to accepting Henderson’s hypothesis in mica was the slowness of solid state diffusion. Here some very important data have been glossed over. Mica contains three types of Po halos, but coalified wood only one. Much evidence suggests the 210Po halos in coalified wood formed from selective accumulation of 210Po and 210Pb, which have half-lives sufficiently long (138 days and 22 years, respectively) to have migrated to the radiocenters before serious loss occurred from decay. Likewise, the relatively short half-lives of 214Pb and 218Po (27 minutes and 3 minutes, respectively) mean these nuclides generally decayed away before reaching the accumulation sites, which explains the absence of 214Po and 218Po halos. Thus the crucial question is: If Henderson’s model results in only 210Po halos being formed under ideal conditions of rapid transport (plus an abundant supply) of U-derived Po atoms, then how can this model account for all three Po halo types in mica, where both the U content and the transport rate are considerably lower? Indeed, the close proximity in clear mica (i.e., without any conduits) of two or more types of Po halos presents what may be incontrovertible evidence against explaining these halos by Henderson’s hypothesis [Feather, 1978]. The publication of this response showed that Dr. Spilhaus was determined to abide by the principles enunciated in The Affirmation of Freedom of Inquiry and Expression (see Overview). This was the second time that scientists had been challenged to produce the experimental results that would substantiate the evolutionary view of earth history, and at the same time, in theory, falsify my evidence for creation. I wondered whether there would now be a response, or whether the challenge would continue to be ignored. The earth and planetary sciences receive much support from the NSF through grants to university science departments for research based on the evolutionary model of origins. But has the NSF been equally inclined to support research related to a creation-based model of earth history? This chapter focuses on the reaction of NSF officials after it was more generally recognized that my scientific discoveries supported creation. NSF was supportive of my research before they were aware that the implications were damaging to an evolutionary point of view. In 1974 the NSF awarded me a two-year grant, later extended to mid-1977, of approximately $55,000 for research on both polonium halos and the unexplained dwarf and giant halos. At the time this grant was awarded, the implications of my research had not been revealed to their fullest extent. Quite possibly most NSF officials and reviewers were then unaware that polonium halos provided evidence for an instantaneous creation of the earth. Several of my scientific reports were published during the 1974-77 grant period: one related to my investigations of the “spectacle halo,” a second to my work on halos in coalified wood, and another to the existence of superheavy elements in giant-halo radiocenters. Of these three, the results on giant halos and superheavy elements attracted the greatest attention and the greatest criticism. A background of my research efforts on superheavy elements will be given here to help the reader understand some of the NSF comments about my research proposals. As earlier noted, the primary reason for my affiliation with ORNL in 1969 was to investigate whether the dwarf or giant halos provided evidence of superheavy elements. Consequently, much of my research there concentrated on these unusual halos in collaboration with colleagues at ORNL. In spite of considerable effort, by 1975 none of our investigations of giant and dwarf halos showed any convincing evidence of superheavy elements. In mid-1975 I learned of a new analytical technique for determining the composition of tiny particles collected in air-pollution studies. In this technique the ion beam from a nuclear accelerator was used to excite the characteristic x rays of the chemical elements composing the particle. Its very high sensitivity seemed ideally suited for searching for superheavy elements in the microscopic-sized radiocenters of the giant halos. In early 1976 I began a collaboration with physicists at Florida State University at Tallahassee (FSU) and the University of California at Davis (UC-Davis) to search for superheavy elements in giant-halo radiocenters. My main contribution to SHEP (SuperHeavy Element Project) was in supplying the samples to the experimenters at FSU. We conducted our experiments on the Van de Graaff accelerator located in the FSU physics department. A few months after experimentation began, we found what appeared to be indications of superheavy elements in the tiny radiocenters of certain giant halos. Based on the results of our experiments, we prepared a joint article for Physical Review Letters, a rapid-publication physics journal. The article announcing our evidence for superheavy elements was published in the July 5, 1976, issue (Gentry et al. 1976b). This report immediately triggered a greatly intensified worldwide search for superheavy elements. The possible discovery of superheavy elements was featured in all major science news magazines and made the headlines of several newspapers. Unfortunately, later experiments did not confirm our original interpretation of the evidence. I participated in two elaborate follow-up experiments with colleagues from ORNL, but neither provided any data indicative of superheavy elements. The results of these experiments were subsequently published in two separate reports in Physical Review Letters (Sparks et al. 1977 and 1978). … Dr. Todd the Assistant Director for Astronomical, Atmospheric, Earth, and Atmospheric Sciences, National Science Foundation, ignored the three main points of my appeal letter: (1) NSF support of the other researchers who participated in the original superheavy element experiments, while denying similar support for my research; (2) the panel’s refusal to acknowledge that I had proposed a hypothesis for the origin of polonium halos; (3) my claim of finding evidence which challenges the foundations of modern cosmology and geochemistry. Todd’s silence on these points led me to believe it would be futile to appeal this decision to a higher level of NSF. Was my proposal rejected because of philosophic bias rather than scientific considerations? details of my research on the giant, dwarf, and polonium halos. My interview with the news magazine Christian Citizen (Melnick 1981) prompted an individual to contact his U.S. Congressional Representative about the NSF handling of my 1977 proposal. The correspondence between the Congressman and the NSF was forwarded to me. This letter implies that all six reviewers gave negative evaluations of the 1977 proposal, when, in fact, four reviews were actually positive. (The two negative ones focused on my superheavy element research.) It also suggests a decline in the standard of my research. How did the NSF determine that this proposal “did not measure up to” my earlier standards or the standards of the Foundation? Usually the NSF takes the publication record during the preceding grant period as a prime indicator of whether an investigator is making progress in his research. Three reports were published during the 1974-76 grant period, and after the rejection of my 1977 proposal, five additional scientific reports were published in the next five years. Thus as far as my scientific publications were concerned, there certainly had been no decline in my standards. Moreover, the words, “Dr. Gentry is the world’s leading authority on the observation and measurement of anomalous radioactive haloes,” are in the present tense. If, by the NSF’s own admission, I still had that reputation at the time Johnson wrote the letter (June 1982), then my research after 1977 did continue to maintain the standards of my earlier endeavors. And if the NSF classifies someone as an authority in his field, doesn’t this imply he has met the Foundation’s “standard” of scientific merit? Representative Walker was not given the full picture. By withholding copies of my correspondence with Dr. Todd, Johnson glossed over the NSF’s discriminatory treatment of my proposal. But more to the point, if my appeal letter had been sent to Walker, he could have seen that the NSF avoided responding to my evidences for creation. To find out if Johnson’s failure to send my appeal letters was inadvertent, I called him around July 28, 1982, and pointed out that, in all fairness, his correspondence with Walker left a distinctly erroneous impression. He responded that he was under no obligation to send my appeal letters and drew the conversation to a close. In his letter Johnson assured Walker that the NSF would “be pleased to review and evaluate a proposal from Dr. Gentry at any time. I assure you that any submission will be given a fair, honest and open appraisal by his peers and that if they judge his ideas as worthy of support, he will be funded” (Johnson 1982; Appendix). The issue is what standard will be used to judge whether my ideas are “worthy of support” or not? If scientific credibility hinges upon whether the data support evolutionary ideas, then obviously my research would not measure up to the “standards” of the NSF. Johnson cites my previous grants as evidence that the NSF was fair about my earlier proposals. However, he omits relevant information about them: the previous NSF support was given during the early 1970’s, a time when the implications of my work for creation were not realized by the scientific community at large. So my experiences show that, contrary to Johnson’s words, the publication of “unorthodox scientific views” about creation science did indeed present a “barrier to the receipt of NSF support,” once its reviewers understood the issues. The NSF has a long history of funding proposals which encompass the evolutionary position. Certainly one of the largest grants of this nature was for the Biological Science Curriculum Study (BSCS), which in 1964 published a controversial series of textbooks incorporating evolution as a major theme. Another topic that provided heat, if not light, was the revived anti-evolution movement. Physicist Rolf M. Sinclair of the National Science Foundation organized a session titled “Views of the Universe: Science versus Tradition.” He came out of his ivory tower, he says, and was shocked to find out what the creationists are doing in schools. Their success in getting school districts to teach creationist ideas is restricting and perverting science education, he says. Shortly thereafter Sinclair elaborated further on his views in a letter to this news magazine (Sinclair 1981). There he emphasized that the solar system had come into being several billion years ago and that the entire universe began in a “big bang” tens of billions of years ago. He also expressed full confidence in the overall record of organic evolution and, in particular, the record of life on earth going back more than a billion years. Both conclusions carry the connotation that evolution is beyond dispute. Since its inception, the NSF has expended vast sums to support research projects based on evolutionary assumptions. It may be argued that the NSF is justified in expending these huge sums because a number of prominent scientists, such as Dr. Sinclair, overwhelmingly endorse evolution as a confirmed theory, or even as fact. If the NSF could prove that evolution is the true description of the origin and development of the cosmos, the earth, and life, then the NSF would be justified in denying funding to scientists whose research proposals question the evolutionary scenario. But evolution is neither confirmed theory nor fact. If life actually originated by chance, as evolution requires, evolutionary biologists should be able to reproduce that process in laboratory experiments. Still, despite decades of intensive efforts and generous government funding, all attempts to produce life from inert matter have proved fruitless. Likewise, if life evolved by the transformation of one major group into another, where are the numerous transitional forms expected on the basis of evolution? Biologists could long ago have put to rest embarrassing questions about the general absence of transitional forms in the fossil record if they had produced examples of missing links under laboratory conditions. All attempts to create new forms in the laboratory, such as inducing mutations through nuclear irradiation, have produced only variations of existing types. Developing new features in fish, for example, until they begin to develop into amphibians should certainly be simpler than creating life itself and would be the presently observable evidence needed to make evolution a science instead of speculation. There would then be no dispute about its validity. Since no such demonstration has been accomplished, at best the NSF should consider evolution as a widely held but unproven theory. The NSF is thus morally obligated to treat it as open to challenge, in the spirit of the Affirmation of Freedom of Inquiry and Expression(see Overview). Written by evolutionists themselves, it declares that “all discoveries and ideas . . . may be challenged without restriction.” I assume that the NSF should also abide by another principle of the Affirmation: “Freedom of inquiry and dissemination of ideas require that those so engaged be free to search where their inquiry leads without fear of retribution in consequence of the unpopularity of their conclusions.” The reader may decide whether the NSF adhered to this principle in its evaluation of my 1977 and 1979 proposals to continue work on radioactive halos. The documentation in this chapter shows the reaction of the NSF after they were convinced that my discoveries were contradictory to the “accepted” model of earth history. Little did I suspect when my work began in 1962 that nineteen years later the results of my research would become a public issue. This all started in the spring of 1981 when the Arkansas state legislature passed Act 590, a bill requiring “balanced treatment of creation-science and evolution in public schools.” The American Civil Liberties Union (ACLU) filed suit, challenging the constitutionality of the Act, and a trial date was set for December 7, 1981, at the Federal District Court in Little Rock. The enactment of Act 590 served as a reminder of the anti-evolution law, the Butler Act, passed in Tennessee in 1925. That law was also challenged by the ACLU, and this led to the famous Scopes trial in Dayton, Tennessee. It is necessary to focus briefly on this earlier trial because its popular legacy as an overwhelming victory for evolution was a key factor in shaping the outcome of the Arkansas trial. The principals in the 1925 trial were (1) John Scopes, a high school football coach and substitute science teacher, (2) William Jennings Bryan, the great fundamentalist orator and three times presidential candidate, who prosecuted the case against Scopes, and (3) Clarence Darrow, the eminent trial lawyer, who defended Scopes. Scopes’ voluntary assent to be arrested for teaching evolution became nationwide news. The reaction to this extraordinary publicity showed that many Americans felt the foundations of their religious beliefs were at stake in this battle. To some the trial was seen as a means of either confirming or denying their understanding of the Scriptures. Generally, popular accounts of the trial picture William Jennings Bryan as a man who feared the truth because of his presumed refusal to permit expert testimony for evolution to be given at the trial. Clarence Darrow, on the other hand, is credited with having outmaneuvered such bigotry when he arranged for his expert witnesses to give their scientific evidences for evolution to the news reporters covering the trial. By this master stroke, Darrow managed to have the theory of evolution disseminated to the remotest bounds of the civilized world. Just as significantly, this was accomplished without any arguments against evolution being mentioned. Thus evolution appeared to be based on incontrovertible evidence. As a result, evolution is thought to have won the day (even though Scopes lost on a technicality). The perceived outcome of the trial among scientists was both pervasive and self-perpetuating. From henceforth any scientist who openly professed any belief in a literal interpretation of Genesis became suspect among his peers. This disdain for creation was passed on to each new generation of university students by both scientists themselves and educators, many of whom knew no better than to echo their scientific colleagues. Since the Scopes trial, three generations of college-educated Americans have been indoctrinated with the view that evolution represents scientific truth. This widespread indoctrination provided the ACLU with a tremendous psychological advantage as they prepared for the Arkansas trial. The presiding judge at the Arkansas trial did not live in a vacuum. Even though the Arkansas trial was supposed to be decided solely on the basis of evidence presented in Court, the ACLU well knew the historical impact of the Scopes trial could work to their favor. In addition, the news releases pertaining to the Arkansas trial could be a decisive factor. In general those news reports came from the pens of media representatives who reflected the American cultural scene. It is safe to assume they all had been educated in the mold of contemporary science and its overwhelming preference for evolution. And most likely their image of creation science had been molded by the popular accounts of the Scopes trial. Inevitably their perceptions, and hence their news reports, of the Arkansas trial would reflect the prior conditioning from those accounts. Unfortunately, it seems much that has been written and filmed in certain of those accounts cannot be substantiated either by historical records or by the transcript of the trial. To illustrate, a critique by Dr. David Menton has shown that the account which has received the greatest publicity, namely, the Scopes trial motion picture Inherit the Wind, bears little resemblance to the actual events and details of the trial itself. An important part of this critique (Menton 1985) focuses on the circumstances surrounding the arrest of Scopes for presumably breaking the law. According to the historical records, Scopes maintained he never taught evolution during the two weeks he substituted as a science teacher. Thus, in reality, he never broke the law. His arrest was based on a trumped-up charge. It was contrived, with Scopes’ assent, by a local mine operator so that the ACLU could challenge the Butler Act. “Well you are safe now,” said Hutchinson. Thus, incredible as it seems, those who acted in Scopes’ defense apparently not only knew of, but abetted the situation by encouraging some of Scopes’ students to commit perjury and testify that Scopes had taught evolution. (Interestingly, deCamp’s book (p. 432) singles out Darrow as the lawyer who did the coaching.) In his memoirs Scopes once again disclaimed teaching evolution, which at his trial included a reference to the earth once being “a hot molten mass” (Scopes and Presley 1967, 132-134). At the same time he also attempted to deflect the clear implication of perjury by claiming his students were possibly confused about where they had heard about evolution (Scopes and Presley 1967, 134). These circumstances reveal an aspect of the Scopes trial that is not generally known. MOVIE: The defense is unable to get permission to use their several expert witnesses because Bryan is afraid of their testimony and considers it irrelevant. One by one, Darrow calls his distinguished scientists to the stand but each time, thanks to an ignorant and biased judge, Bryan needs only to say, “objection—irrelevant,” and that is the end of it. All scientific theories, inevitably, are tentative answers to questions about nature. . . . This characteristic of continually revising ideas to reflect the world as it is observed is what makes science. The claim that creationists are unwilling to revise a theory to accommodate observation is nothing more than massive character assassination of all creation scientists. I have already referred to one revision in my own work that occurred in reference to the previously discussed report on superheavy elements. And the claim that creation scientists do not publish in scientific journals is directly contradicted by my own publications. The question could be raised: Just who is attempting to “twist” the evidence? Skow claims that creationists resist unwanted information. His accusations are quite incongruous, for both his and the previously quoted article fail to mention the persuasive evidence for creation published in my scientific reports. Is it possible that he may have the “system of belief” that “resists unwanted information”?